I hope your Thanksgiving celebration was filled with LOVE and a smashing success! We all have so much to be thankful for. Please tell me what was your favorite part or dish. We were lucky enough to have both of our boys home and got to have both girlfriends with us too. It is so about being together, cooking together and even cleaning up together. I come from a very large family – six kids – and when my parents were still alive and we all came home (to St. Louis) with our spouses or mates, it was absolute mayhem – all in a good way. Everyone was doing something from building a fire, to arguing about the music being played, to making a new cocktail for everyone, to complaining that someone doesn’t do any work but just supervises, to figuring out where to put all the food and wine, and I remember my mother just shaking her head and trying to continue to move through everyone to do her cooking. Although we have only two boys, we created the same thing! At one point on Thursday, I looked at my husband, right before dinner and I was like, OMG, we created a mini version of my family all over again. It’s a good thing but it really made me laugh – it can even happen with just two kids! 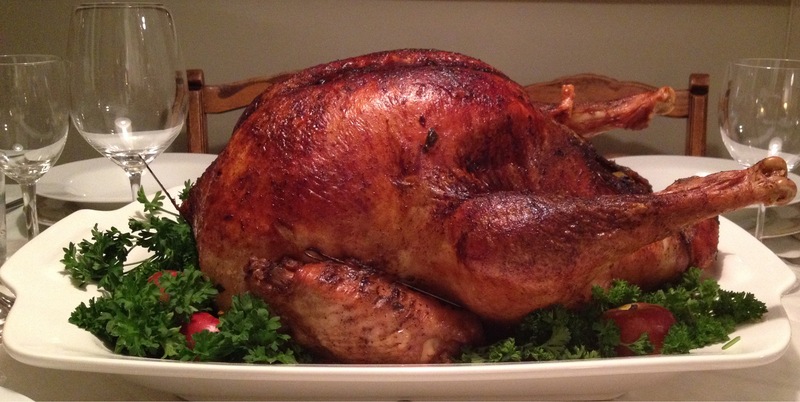 My turkey was too big – 19.5 lbs. I had asked our farmer for a 16 – 17 lb. bird but somehow he had something larger in mind and just those 2 – 3 extra pounds made a difference. I have no doubt we will eat all the leftovers but when it’s that big, the legs are really tough on these free range birds. The thigh dark meat was delicious but the legs, not so much. It looked gorgeous! And some of the outer white meat was a wee bit dry in order to cook the whole thing through. So I think the 17 lb. mark is the max. If you need more, buy two smaller birds. For those of you who purchased my e-cookbook and made some or all of the recipes, I hope you found it helpful. Please send me any comments to make it even better for next year. My birthday was Tuesday and my younger son and his girlfriend were at our house upstate, greeting us when we arrived with appetizers and dinner prepared. I told you I was lucky and had a lot to be thankful for! 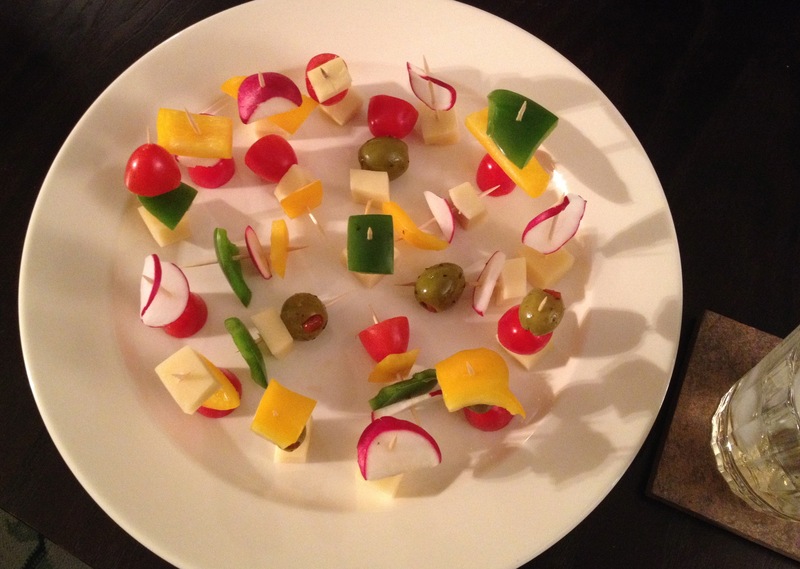 For appetizers, we had local gouda cheese cubes with olives, radishes and cherry tomatoes. 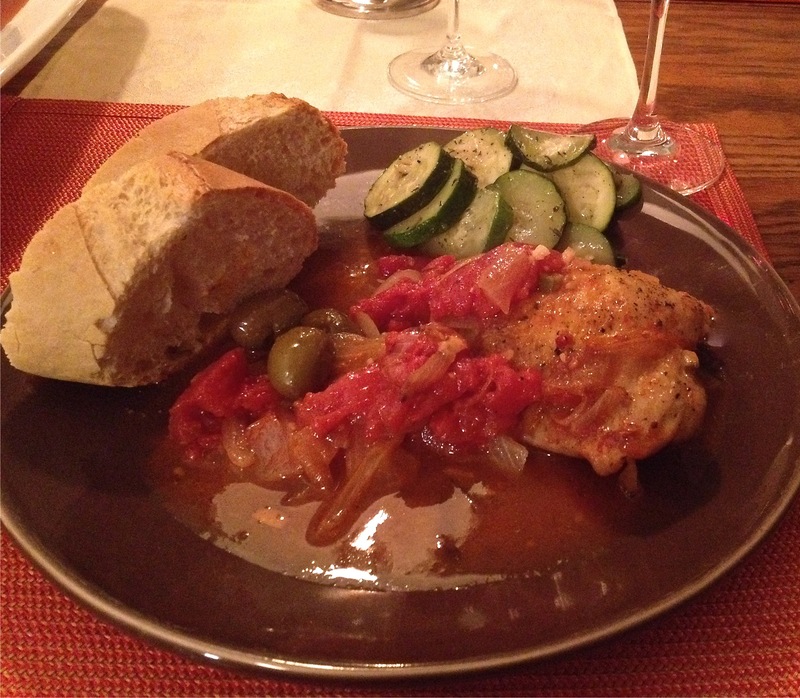 Dinner was braised chicken legs, with tomatoes, onions, garlic and olives served with a crusty baguette to mop up all of the delicious sauce, and some roasted zucchini. They were so sweet and you have no idea how special it was to arrive to a warm glowing, terrific smelling house with dinner all ready! And it was really yummy! Tonight, all four of them are cooking up my “real birthday feast. “ They won’t tell me what they’re doing and I was told to vacate the premises. They have plied me with some hot rum apple punch and I am out in my art studio staying out of the way. They say it will be a complete meal with appetizers, dinner, dessert and even entertainment! Stay tuned and I will let you know what happens. I hope you all continue your celebrations and have a great rest of the weekend! I made the most amazing dinner Monday night, if I might say so myself. Back when I really started cooking, my youngest son (who inscribed the cookbook in the About section) would say to me, “Mom, repeat after me, ‘Yes, I really am a good cook. '” However, I often didn’t, and still don’t now, know what I’m going to cook on any given night — meaning I don’t use recipes and I haven’t necessarily bought things that make sense for one. I usually make up something that I am in the mood for on the subway ride home. I think you have to cook something that you like, something that gets you excited, because that’s part of imparting your love into the dish. Fortunately, my family is usually okay with this. So on Monday, I had a whole chicken and was tired of making roast chicken. 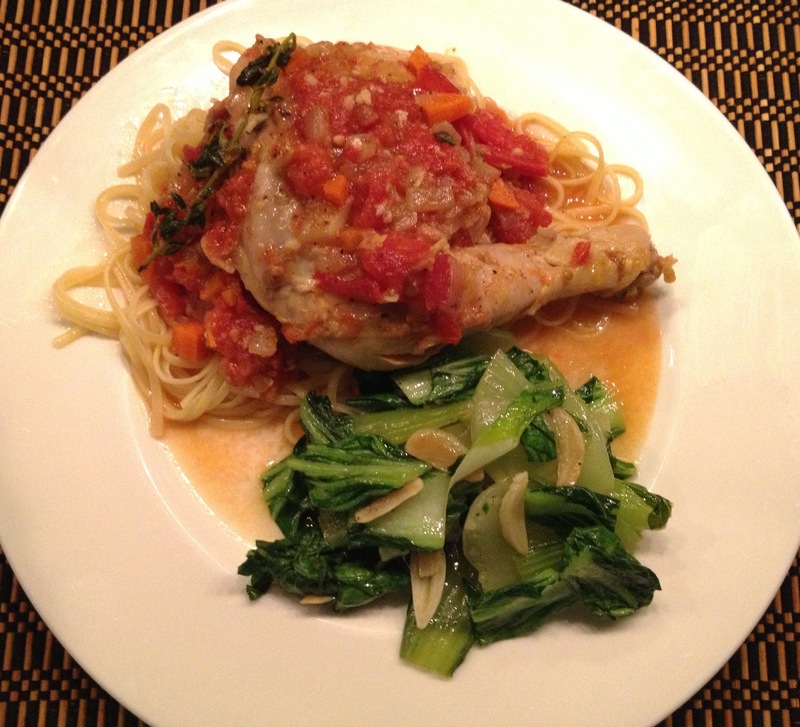 I also had 6 plum tomatoes that needed to be used and was in the mood for a tomato chicken stew over some light pasta. I thought it would be good. I started making it, determined to change his mind and make something he would love. It was fantastic!! Light and packed with flavor and very clean tasting. Actually there is very little oil or fat in this dish. I must say that I also used my Le Creuset Dutch oven to cook this in and I do think that makes a difference. It is such a great pot and no one pays me to say that. I hope you will give this a go, in whatever pot you have. You will not be disappointed. Trim all the fat from the chicken. Wash and dry your pieces thoroughly. Salt and pepper both sides to taste. Heat the oil on medium-high heat in a Dutch oven and place in chicken, skin side down. 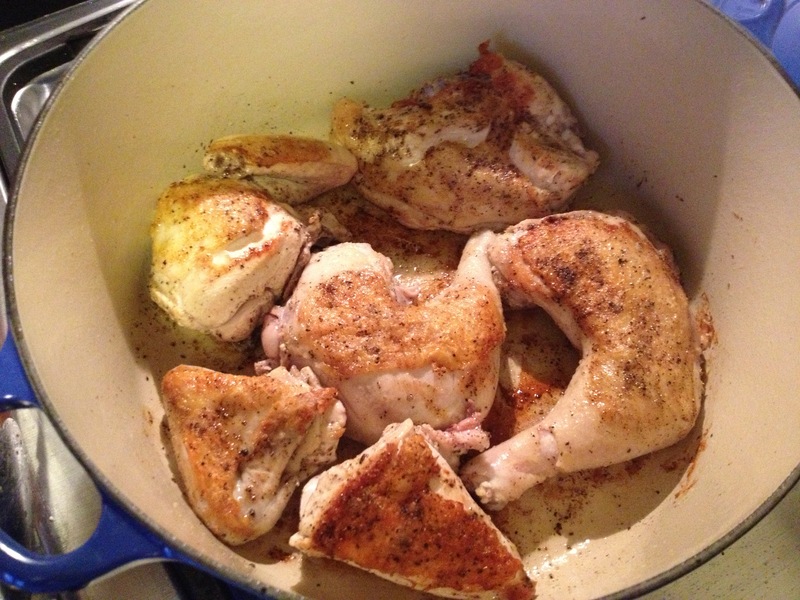 Brown on each side for 5 – 6 minutes, using a metal spatula to turn the chicken over, so you don’t lose the skin. 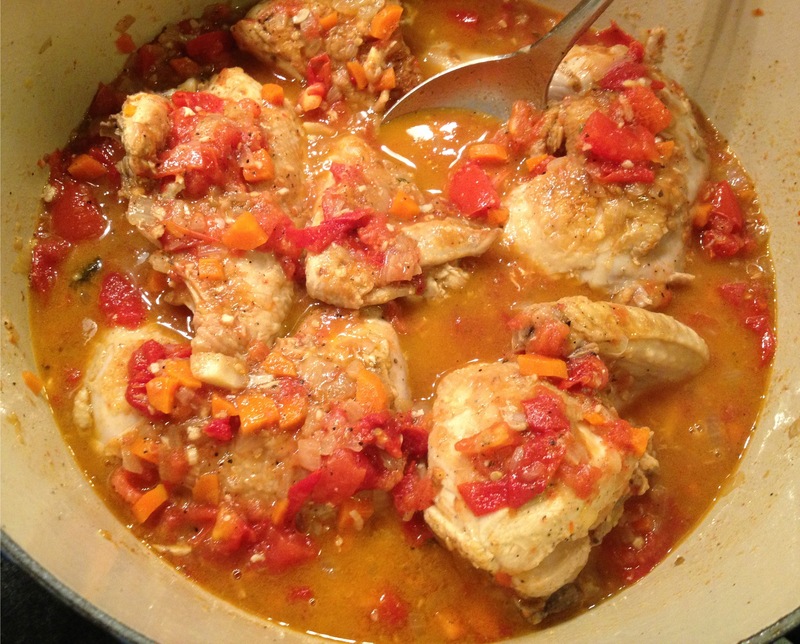 Remove the chicken from the pot and place on a deep plate or pie plate, as juices will collect. Add the onion, garlic, anchovies and carrot to the Dutch oven. Add 2 tbs. water and lower heat to low and cover, to sweat the vegetables and make them sweet. Scape up the bits from the bottom of the pan and stir. After about 5 – 7 minutes, they should have succumbed and become tender and rich. 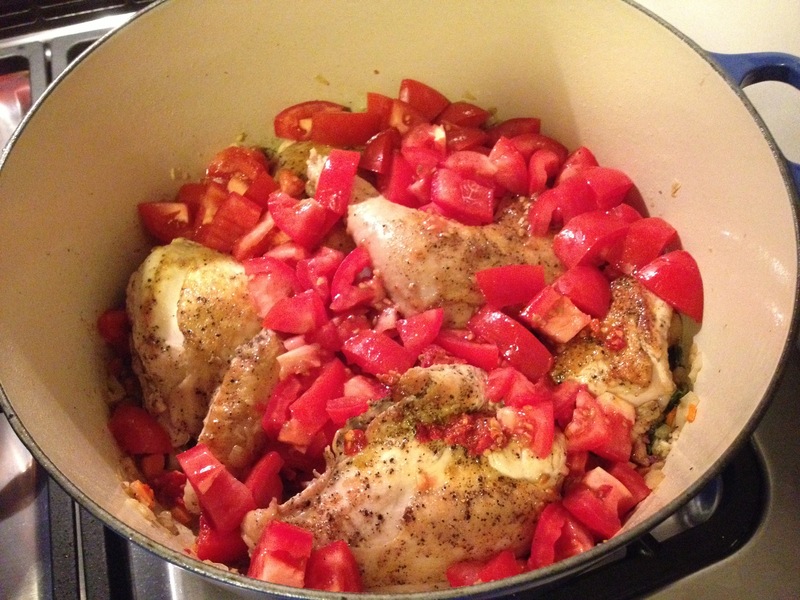 Add your browned chicken back in and blanket with the chopped plum tomatoes, sun dried tomatoes, thyme and oregano. Cover and on low heat, cook for 7 minutes, stir and turn chicken over, cover and cook for another 7 minutes until done. Remove from heat, covered and let sit for 5 – 7 minutes. Temperature on an instant read thermometer should read 155 – 160 degrees. Meanwhile, cook dried fettucine in salted boiling water 1-2 minutes less than the package directions. Drain and toss with a little olive oil. Serve the pasta topped with the chicken and the sauce. Pass the Pecorino Romano cheese and grater if you like. I did, my husband didn’t. This dish was so very flavorful and clean tasting – rich and buttery tasting, yet no butter and very little olive oil or chicken fat to speak of – just delicious, full bodied, clean tasting richness. I know that doesn’t make sense – just trust me – this was very good! The fresh tomatoes were ripe and bright, anchovies always add a burst of flavor and the carrot sweetened it all. Not to mention the herbs were just cut from my garden upstate the day before. We are very lucky to have that, I know. I served this with baby bok choy from Ethel’s garden, sautéed with a little olive oil, water, garlic, salt and pepper. Just delicious! Whether you make this dish or your own concoction, make it with LOVE and it will taste amazing! Truly! Now I digress. Very early this morning I had a dream about my youngest son. He was back to being three years old and had a large, terrible wound on his back with a scab, and it was in the shape of a heart! He didn’t mind it, unless you touched it. It was almost as if he didn’t know it was there, he was such a trouper. But I was so concerned for him. I felt so sorry. I wanted to keep sleeping and stay in the dream to make sure he was okay and not in pain. He seemed to know how he got it – some sort of scuffle with another kid – like he knew what he doing and was okay with the wound. Very weird. Any dream interpreters out there? You see – she wasn’t making it with LOVE! You must be in happy place when cooking and your food will always taste better! Well, it’s better to be in a happy, loving place all the time anyway, right? It is also always best to make your own chicken stock. 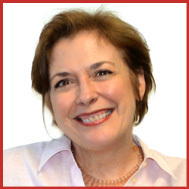 It’s really very, very easy and you feel so professional and accomplished when you do it. At least I do! If you make it yourself, you know exactly what’s in it AND you control the salt. And when you make it with LOVE, it’s happy chicken stock! When finished, it keeps easily in the freezer. Dividing it into several different sized containers – 1, 2 and 4 cup increments – works well. TIP: And here’s a tip from my oldest son. Even if you just need a ¼ cup or so, thaw the frozen broth in the microwave for a minute or two, just so you can dump it out of the container in one piece on a cutting board and then carefully cut off what you need. Put the rest back into the container and back into the freezer! Pretty cool, eh? So here’s the scoop, including some new things I learned at a cooking class I took at the International Culinary Institute (ICE) last fall. Chop your big bones, like legs and thighs, to get more flavor out of the marrow. Add in extra wings and wing tips if you have them as they have the most gelatin, as well as – are you ready for this? – chicken feet!!! This last one I haven’t been able to do yet. Somehow I’m having trouble with the thought and visual of seeing red chicken feet bobbing around in my broth, but hey, who knows? Throw everything into a stock pot, cover with cold water to 1 ½” from the top of the pot, and bring nearly to a boil. Skim off any foam that gathers at the top and remove. Turn heat down to low, to simmer, with the pot lid just slightly ajar. Check and stir periodically and simmer for 4 hours, at least. More time is even better to achieve a dark, rich broth. Let cool and strain all through a cheesecloth lined, fine mesh strainer and divide into containers. Refrigerate, if using within a week or freeze to use whenever. A stock like this insures you’ll make your best risotto ever! I have so much to write to you about. I’m really back logged. There is no lack of food or stories to share with you, just time to write and post them. And then there are some recipes that I really want to get to you now because they are cold weather dishes that are so yummy and while we still have it, before Spring descends upon us, I think you should have them available. But now I want to tell you about our lunch today. Our son Zach, with help from his lovely girlfriend, Agata, made it. Just look at this photo of chunky tomato soup and a two cheese (sharp cheddar and provolone) grilled cheese sandwich. This was so yummy!!! And this was something he wanted to make completely by himself with not a comment or an ounce of help from me. Of course I had to blow it and offer my two cents here and there and I was shooed out of the kitchen – he wanted no part of my advice as well as he should. He doesn’t need me, sad as I think it is, he is more than capable in the kitchen and for that I am so grateful. He never looked at a recipe. I did, before we went to the grocery store together. But he had his own ideas – damn good ones at that! 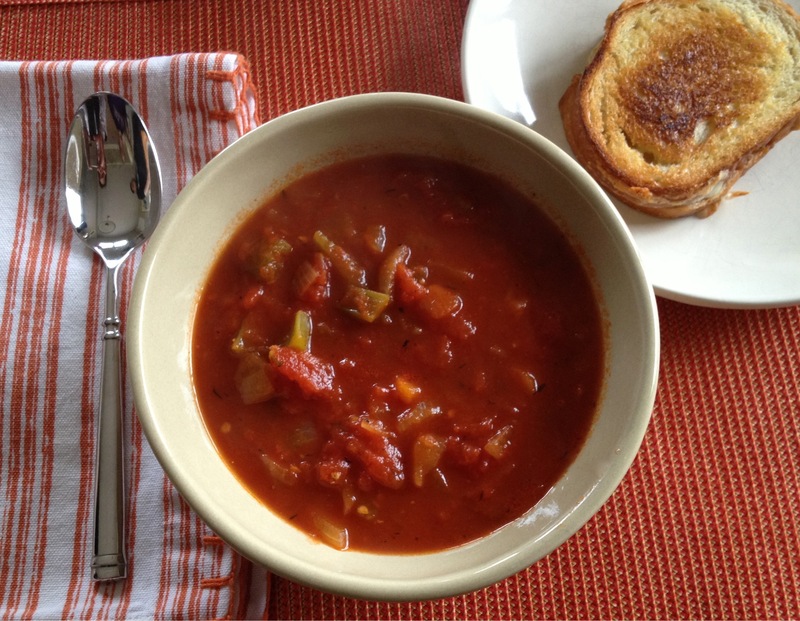 His tomato soup had onions, celery, (3 stalks), carrots, thyme, red pepper flakes and homemade chicken stock. This was the dish my youngest made for me as part of my Mother’s Day dinner. I figured I’d better get this to you before Father’s Day! While I loved their meal, what I love most is watching the two boys cook. They discuss, they gossip, they argue, and then they break into a dance. They are so funny. They planned the meal together and then each was responsible for certain dishes, as opposed to one being the chef and the other being the sous chef. This dish Zach made up while the older one was a Mark Bittman devotee that night. Prepare the zucchini and carrots, slicing them thinly, and set them aside. Chop the onion fine as well. In a large pan, heat a tablespoon of olive oil, add the onions, and cover. Let them simmer, break down and become sweet. While those are cooking, put 4 cups of chicken broth in a saucepan, and bring to a boil. When that boils add the 2 cups of quinoa, turn down the heat, stir and cover; let simmer on low heat for about 12-14 minutes. But don’t forget to stir your onions and check on them! When your onions look good, add the carrots and final cup of broth. Turn up the heat and let the carrots cook in the boiling broth uncovered. After much of the broth is gone, turn down the heat to a simmer, add the zucchini, and cover the pan. 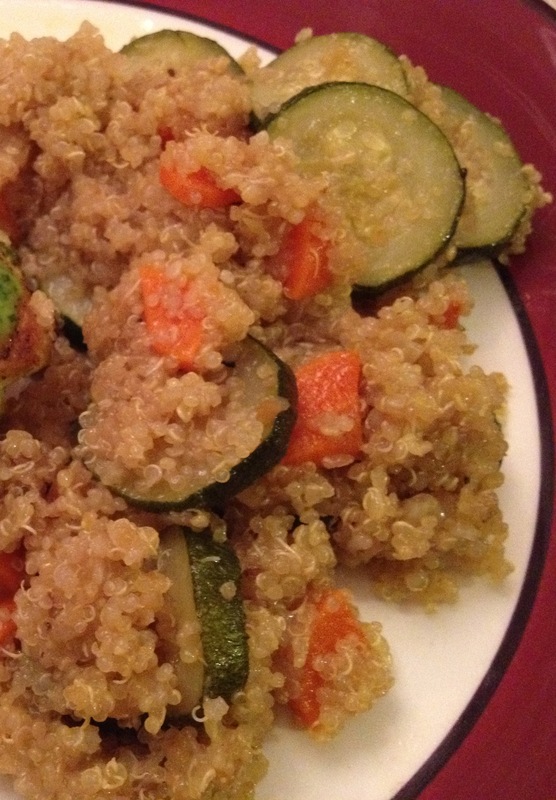 When the zucchini is cooked down, after about 5-7 minutes, add your cooked quinoa and stir. Salt and pepper to taste, but be careful, some store-bought chicken stocks can be salty! I have been wanting to tell you about the first meal I served to our French graduate student who is going to be living with us for four months. Charlotte arrived on the Sunday before last. I wanted to make something super delicious, of course, but something that would keep in case she had issues in customs, and something with some French flavors. I figured a lot of thyme in a wonderful roast and we’d start with an adapted Jacques Pepin frisee salad with a little baby arugula added to it. I have this recipe noted in an earlier post. This roast, however, I will make again and again. It was wonderful! Rich, savory and slightly sweet (from the apples) all at the same time, with the meat tender like butter (buttah)! Both my husband and son claimed it was better than my version of Julia Child’s Boeuf Bourguignon. It was more complex and interesting and let me tell you, a whole lot easier! You just need the time to leave it in the oven for 4 hours. I was so excited to have a Sunday to make this, I took pictures at every point while preparing it, but I forgot to take a shot of the finished dish! Actually, the process pics are prettier and the result was delicious and delectable. Give this a go before the weather gets really warm to envelope yourself in wonderful flavors and sink into pure goodness, with love. I served this with polenta squares, browned in a little olive oil and butter. Really, really yummy. Make the polenta recipe noted in an earlier post, pour into a buttered 9” x 9” pan and chill until firm. Cut into squares and sauté in butter and olive oil (1 tbs. of each) until nicely browned and hot throughout. Preheat the oven to 300 degrees. Place the pork roast on a cutting board so the long end faces you and slice through the middle horizontally and nearly to the other side of roast. Open the roast like a book (it should still be attached at one side) and season with about half of the salt and pepper. Close the roast and season the outside with the remaining salt and pepper, then use butcher’s twine to tie the roast at 1-inch intervals. Heat half the oil in a large skillet over high heat for 2 minutes. Add the pork roast, browning it on all sides, 2 to 3 minutes per side (if it starts to get dark too fast, reduce the heat). Use tongs to transfer the pork to a Dutch oven or heavy-bottomed pot and set aside. Pour the fat from the skillet into a medium bowl (cool and discard). Use tongs and paper towels to wipe out the skillet. Pour the remaining oil into the wiped skillet. Heat the oil over high heat until it smokes, 1½ to 2 minutes. Add the carrots and place the onions and garlic halves cut-side down in the pan. After about 30 seconds, check the garlic and, if nicely browned, remove from the pan and place on a plate (or cook a little longer if needed). Continue to cook the onions and carrots until the onions are very dark (and almost threatening to burn), about 1 minute longer. Turn off the heat and cool the pan for 1 minute. Turn the heat to medium, pour in the wine and simmer until reduced by half, about 5 minutes. Pour in the chicken broth, increase the heat to high and bring to a boil. Turn off the heat and carefully pour the broth and vegetables over the pork in the Dutch oven. Add the thyme, apple, rosemary, peppercorns and lemon-zest strips. Cover the pot, place it in the oven and cook until a long-pronged fork can be inserted into the center and twisted without resistance, about 4 hours. Remove from the oven and transfer the pork to a large platter. Let the meat cool for 15 to 20 minutes before using a fork to break the roast into chunks. Meanwhile, boil the braising liquid and skim off the fat. Pour the jus over the pork and serve.